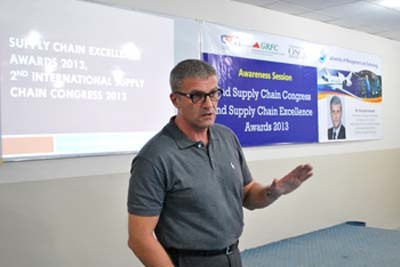 An awareness session on 2nd International Supply Chain Congress and Supply Chain Excellence Awards 2013 was organized by Center for Supply Chain Research (CSCR). 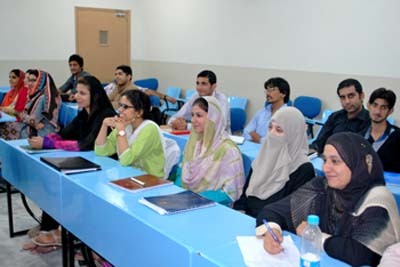 The session was attended by about 40 MS Students and PhD scholars, and UMT faculty members. Guests from local and foreign corporate sector graced the occasion. Husnain Javeed, training head of SMEDA, Touqir Khan Lodhi, CEO, Aries Logistics and President of Global Research and Facilitation Council (GRFC), Rizwan Ahmad, Manager Sales at Agility Logistics, and Vice President GRFC, Imran Ahmed, Secretary General/ Legal Affairs GRFC, Riccardo Farinelli, GRF representative in Italy and Former National Supply Chain Manager of a shipping Line in Europe, were also present . Ijaz Yusuf, Director of CSCR, briefed about the session and introduced guests to the audience. He also highlighted the active part of UMT and CSCR in awards ceremony scheduled for November 12, 2013. Rizwan Ahmad discussed the details about GRFC and categories of awards. 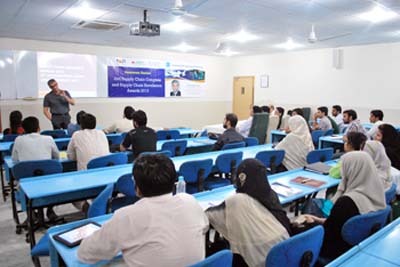 The key benefits to UMT student include complimentary workshop at CSCR, UMT, and pre-qualification for International Supply Chain Conference 2014 in Rome, Italy, organized by GRFC. The best student would be part of GRFC European professional steering committee on supply chain management, giving them a chance to learn and exchange ideas while traveling to observe European standards. Under ISCEA, Ptak awards would be offered to the professional students in conference. 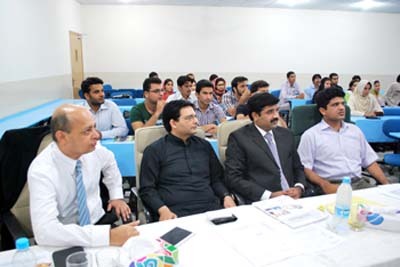 Hence they will get scholarships on world renowned supply chain certifications (SCCM, CSCA, CLM, RFIDSCM). The profile of the professionals would be displayed on international website of GRFC and their research paper would be on website for next 2 years and International Supply Chain community would have an access to this data for publications and the best paper would get a chance to apply for a visa in international conference 2014 in Rome. Riccardo Farinelli shared his views about Pakistan. 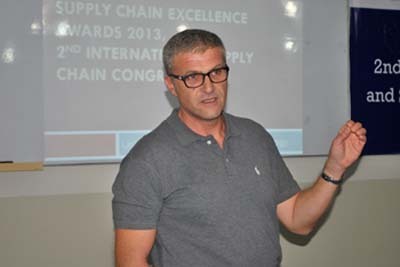 He said that supply chain management in Pakistan is not less than any other country in West. He also appreciated the team work, synergy, values, and cooperation as key elements of supply chain management in Pakistan. Ijaz Yusuf gave the note of thanks to all the guests. He honored Riccardo Farinelli and Touqir Khan Lodhi with a UMT souvenir. Rizwan Ahmad received the souvenir by Khalil Arbi, Assistant Professor, SPA.